Get ready for the internet prank to end all internet pranks. You’d better start taking notes, because this is how it’s done. Some brilliant troll just rewrote the book on pulling online practical jokes by uploading a photo of Helicobacter pylori bacteria to the Wikipedia page for Burkholderia cenocepacia. Shut down the internet, folks! We have a winner. Nailed it! Imagine the looks on people’s faces when they’re expecting to see a picture of Burkholderia cenocepacia and they see that! This one’s already on the wall of legends. 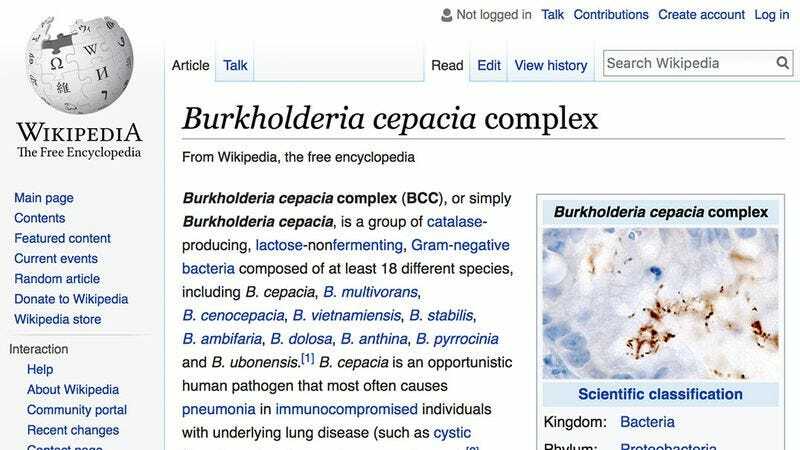 If you visited the page for Burkholderia cenocepacia this morning, you probably did a double take: Wait a second. Is that a photo of…Helicobacter pylori?? Yup. Its helical shape and 0.5-μm diameter are pretty unmistakeable, so anyone who gets fooled by this one deserves what’s coming to them. College students all over the world are likely using the photo of Helicobacter pylori for presentations on Burkholderia cenocepacia. Websites are probably hot-linking to the completely wrong bacteria. Who knows how much damage has already been done? Best of all, it seems the mastermind behind this one had no motive but chaos itself. Some people just want to watch the world burn, and the fire this one has started is going to be burning down the internet for a long time to come. The true beauty of this perfect trolling lies in its elegant simplicity. The anonymous genius could have gotten greedy and swapped the descriptions of the genomes and transcriptomes of the two Gram-negative bacteria strains, but they didn’t go overboard. With the precision of a cat burglar stealing a priceless jewel, they got in, slipped a photo of Helicobacter pylori onto the page for Burkholderia cenocepacia, and got out. And it’s perfect. This is the game-changing internet prank you’ll be telling your grandkids about. Even after Wikipedia gets wise and changes the photo of Helicobacter pylori back to a photo of Burkholderia cenocepacia, there’s no way people will be able to visit the page for either bacteria without cracking up for years to come. We may never find out who pulled this off, but they delivered the major laugh the world needs right now. The internet thanks you, anonymous troll. You’re a true hero, whoever you are. UPDATE: We just checked in, and it’s been 24 hours since it was first posted, and the picture of Helicobacter pylori is still triumphantly displayed on Burkholderia cenocepacia’s Wikipedia page! Don’t be a narc. The longer it stays up, the more epic this will become.